The Low Bar: Animal Farm Friday II - Lets hear it for the bull! Animal Farm Friday II - Lets hear it for the bull! 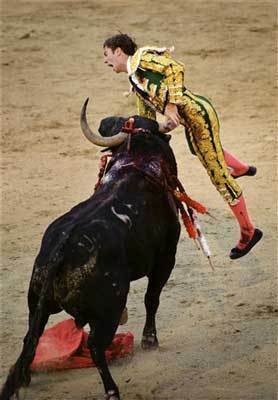 I have zero sympathy for Spanish bullfighter, Israel Lancho, nor for any bullfighter who is gored, trampled, or even killed by the bulls they taunt and mutilate towards a slow and painful death. Just deserves, scum bags. Hooray for the bull, for scoring a small win!